The MateBook 13 is Huawei’s latest premium Windows notebook. The all-new MateBook 13 features a 13-inch 2160 x 1440 touchscreen display in the 3:2 aspect ratio. The gorgeous touchscreen has an 88% screen to body ratio, 1000:1 contrast, and 300 nits brightness. Powering the MateBook 13 are the brand new Intel Whiskey Lake 8th gen processors with two different variants to choose from. The first one being an i5-8265U model with integrated Intel UHD Graphics 620 and 256GB NVMe PCIe SSD storage. A more powerful variant is also available featuring the i7-8565U processor with a discrete NVIDIA GeForce MX 150 graphics card with 2GB of GDDR5 RAM and a 512GB NVMe PCIe SSD hard drive. Both models will come with 8GB of RAM. In order to keep it cool and quiet, Huawei uses its innovative Huawei Shark Fin Design 2.0. Thanks to this technology, it increases the airflow 25% more and decreases the noise by 3db when watching videos. Huawei has squeezed in a rather large 41.7Wh battery into the MateBook 13 which offers up to 10 hours of FHD video playback and 7.3 hours of continuous web surfing on the i5 model. The i7 MateBook 13 clocks in with slightly less time with 9.6 hours of FHD video playback and 7.2 hours of continuous web browsing. The MateBook 13 also makes use of Huawei’s fantastic fingerprint scanning technology with the scanner built into the power button. You’ll also find two USB-C ports, one on either side with the left port supporting charging and data transfers. While the right USB-C port will support data transfers and act as a display port. 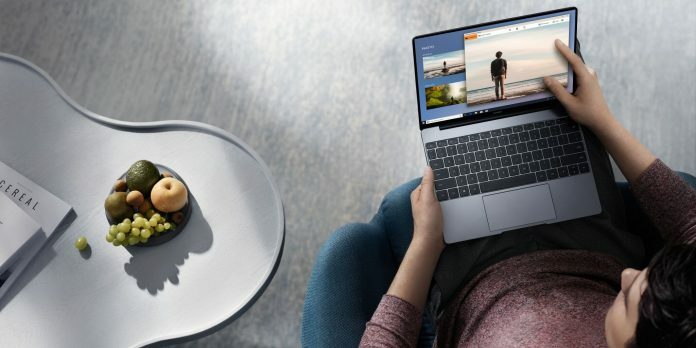 Bluetooth 5.0 is included on the MateBook 13 but no worries if you prefer a wired headphones or a mic because there is a 2-in-1 3.5mm jack as well. Along with Dolby Atmos support to bring sound alive when watching videos using headphones. The included 65w USB-C power adapter is as slim as it is powerful offering up to 2.5 hours of office use from a 15-minute charge. 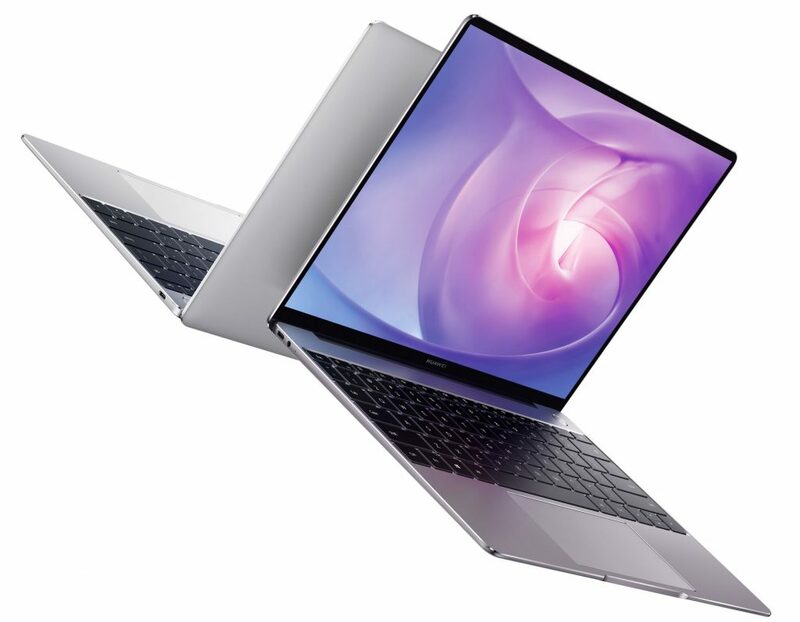 Both MateBook 13 models will come with the Huawei MateDock 2 and one year of Microsoft Office Personal. 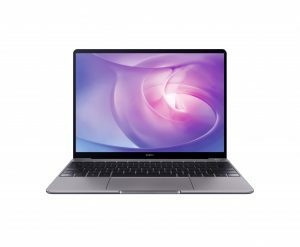 The MateBook 13 will be available in Mystic Silver with the i5 model selling for $999. While the MateBook 13 i7 model will be available in Space Gray for $1299. Both will be on sale from Amazon and Newegg beginning January 29 and from other retailers starting in February. 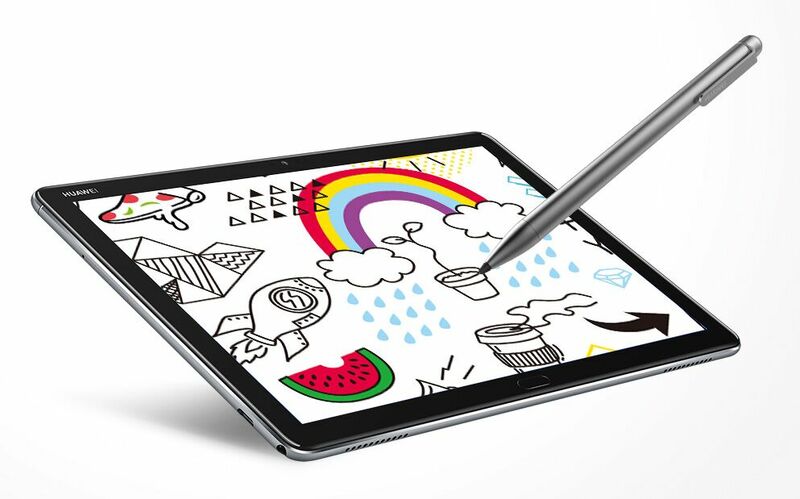 The MediaPad M5 Lite is Huawei’s latest tablet packed with family-friendly features. These include Kid’s Corner, advanced Eye-comfort mode, and a fingerprint sensor that can be used to enable parental controls. The built-in fingerprint sensor can be used to set up profiles for sharing with the family and to set access parameters for certain users. Kid’s Corner will allow parents to set time limits and control access to content. While the Distance sensor, Posture Detect sensor, Ambient Light sensor, and Blue Ray Filter work together to protect your vision. When the Distance sensor detects your face within 9.8-inches it will warn you and suggest moving back to a further distance. The Posture Detect sensor does something similar by detecting when you’re viewing at an extreme angle and provides posture guidance. While the Blue Ray Filter and Ambient Light sensor work together to adapt the color and brightness of the display based on your surroundings. The MediaPad M5 Lite comes with a 10.1-inch 1920 x 1200 Full HD IPS LCD display. It is powered by a Kirin 659 CPU, 3GB of RAM, includes 32GB of storage, and is expandable up to 256GB with a microSD card. Out of the box, it runs Android 8.0 with EMUI 8.0 and includes a quad speaker setup. Huawei has packed in a large 7500mAh battery along with Huawei QuickCharge technology that can provide a full charge within 3 hours. Once fully charged the MediaPad M5 Lite offers up to 13 hours of video playback and 8.5 hours of gaming. The MediaPad M5 Lite is expected to retail for $299 from Amazon and Newegg beginning in late January. It will come in Space Gray and also include the M-Pen lite stylus.